What should you do if an unfamiliar cat appears in your area? Our recommended actions depend very much on the type of cat you have found. Is it a Chancer, a Stray, or a Feral? A Chancer is not a stray cat – it is owned. It will usually appear healthy and clean and will often be very confident. These are often the cats that you will find eating from your own cat’s bowl. A Stray cat usually appears ‘grubby’, sometimes with matted fur. They may be friendly or very timid, but can often be coaxed towards you with food, or come into plain sight to eat food left for them. They may appear skinny, or in the case of large unneutered males, they may appear stocky with large cheeks. Often they will have battle-scarred faces and ears. You are unlikely to see a true Feral cat, especially during the day, because they are experts at staying hidden. They are expert hunters and tend to operate at night. Unless unwell, they usually appear extremely clean. A feral cat will almost never approach you – no matter how much tuna you wave at it! Stray cats seldom turn feral, although long-term strays are often untrusting and fearful. If you believe you are facing a feral cat please contact the Shelter for advice. There is a fourth category of cat – those in dire and immediate need. They may be injured or appear seriously unwell. Pregnant female strays or stray mums nursing kittens also fall into this category. If you find a cat in this category call the SSPCA (03000 999 999) or your local rescue immediately. 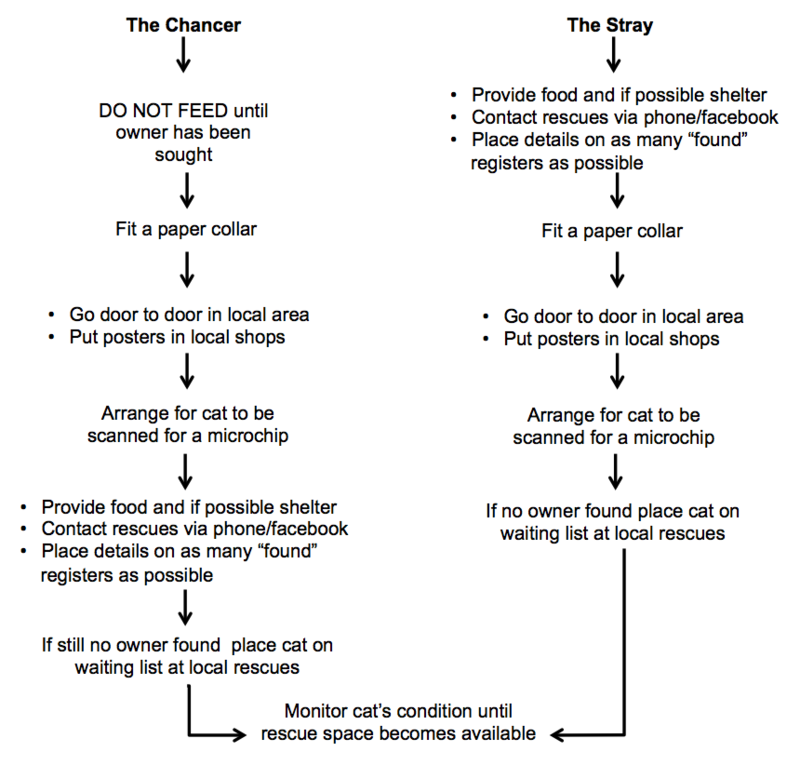 We DO NOT recommend you immediately take a Chancer or a Stray into your home or bring it immediately to a cat rescue – please try and locate an owner first. We DO NOT recommend you feed a cat that appears to be healthy and clean. This will only encourage a Chancer to continue to stay in your immediate area when it might otherwise find its way home. Do not put yourself in danger – if you’re concerned the cat may injure you, please call for advice. A paper collar is a thin 1cm wide strip of paper long enough to fit around the cat’s neck, secured at the ends with a piece of sellotape, such that 1 or 2 fingers can fit underneath. Write ‘This cat visits me. If this is your cat please call XXXX’ on the collar. We are always at the end of the phone should you need any specific guidance but we hope this serves as a helpful general guide.